Who is like Jesus or comparable to Him? He is the Living One, risen from the dead. He is incomparable! He is beyond any man’s equal, matchless, unsurpassed, the Divine Son of God! More than two thousand years ago Jesus was born contrary to the laws of life. He was born of a virgin. As He grew into manhood He lived in poverty and was reared in some mystery. Jesus did not travel much out of Palestine. Once fleeing from King Herod He went to Egypt and another time He went into the district of Tyre and Sidon. Jesus never possessed wealth or influence. Jesus never received formal training or education. In childhood He puzzled the Scribes, lawyers, and doctors of the Law. In manhood Jesus ruled over the Laws of nature, He walked upon the billows of the sea as if they were pavement and told the sea to be calm. Jesus healed the multitudes without medicine and He did not charge anyone for His services. Jesus never wrote a book, yet thousands of books have been written about Him. Jesus never wrote a song, yet He has inspired more songwriters than any other person that has ever lived. Jesus never started a college, but all the colleges put together cannot boast of having as many students. Jesus never practiced psychiatry and yet He has healed more broken hearts and minds than all the doctors in the world. And on the first day of the week multitudes make their way to assemble around His table and remember His death, burial and resurrection and to proclaim His death to the world until He comes again. Almost two thousand years have passed since the crucifixion of Jesus Christ our Lord, yet He still lives. Annas the High Priest and the Jews, Pilate and the Romans, Herod and the devil and his forces could not destroy Him. Death and Hades could not hold the Divine Son of God. Jesus Christ stands forth upon the highest pinnacle of heavenly glory, proclaimed of by God, acknowledged by angels, adored by saints and feared by the devil and his fallen angels, as the LIVING ONE, RISEN FROM THE DEAD! Jesus is alive forevermore seated at the right hand of God our Father in heaven – and He is incomparable! Sadie is somehow closer to a year old than she is to her newborn days. C-r-a-z-y. Here’s what’s up with Sadie girl at six months. Growth At her six month check up, she was 14 pounds, 8.5 ounces and 25 inches long. She’s a tiny little gal, in the 20th percentile for weight and 34th percentile for height. Thankfully she’s growing right on track, though! Wearing Six month onesies and nine month outfits because it’s easier to get her head through the neck of the shirt. She’s in size three diapers now. Eating We got the go ahead to start solid food from our pediatrician. Despite being interested in food, Sadie didn’t swallow anything for a few weeks. She would just push food out of her mouth until one day she decided to swallow broccoli! Wer’e using the baby led weaning method of feeding Sadie, mostly because it makes sense and because she’s not into baby food and being fed at all. She wants to feed herself and play with her food instead of having it spooned into her mouth, lol. Shes still getting 99.9% of her nutrition from breastfeeding, which is going well! She still does her best eating in the middle of the night when there are no distractions. As far as solids, she seems to like watermelon, oranges, toast, pita bread, pancakes, asparagus, broccoli, cauliflower, zucchini, eggs, pancakes, and pork. She’s also had salmon, carrots, peanut butter, avocado, mango, sweet potatoes, and a few other things I’m probably forgetting. We gave her a lemon wedge while out to eat and she ate it like a champ and didn’t pucker up at all. Strange! Personality Sadie is so sweet, pleasant, fun-loving, and generally happy. She enjoys meeting new people and almost always smiles at strangers. We even dropped her off in the church nursery while on vacation and she did great with the worker and other children! When she’s home with Jimmy and me, she is very silly and talkative. Nicknames Sadie Lady, Sader Tot, Totling, Tottle Berry, Todd, Darth Sader, Stone Cold Sadie, and Mini Jimmy (because she looks so much like Jimmy). Sleeping We’ve been working on sleep training Sadie, but still take her into bed with us to eat in the middle of the night because she does her best eating then. It has been amazing to have a semi-set bedtime for her between 7 and 8 and to know that Jimmy and I will have some time to relax before she’s up again to eat within a few hours. We’re slowly weaning Sadie off of the Merlin’s Magic Sleepsuit (which we really liked!) and into a sleep sack instead since it’s getting warmer outside. As far as napping, she’s all over the place. She generally takes three naps a day from 30 minutes to 2 hours, it just depends on what we’re doing that day and how tired she is. New skills Sadie is sitting up! She also started babbling ba-ba-ba, da-da-da, sprouted two bottom teeth, and sticks her tongue out all the time. She also rolled from her back to stomach once during a nap. 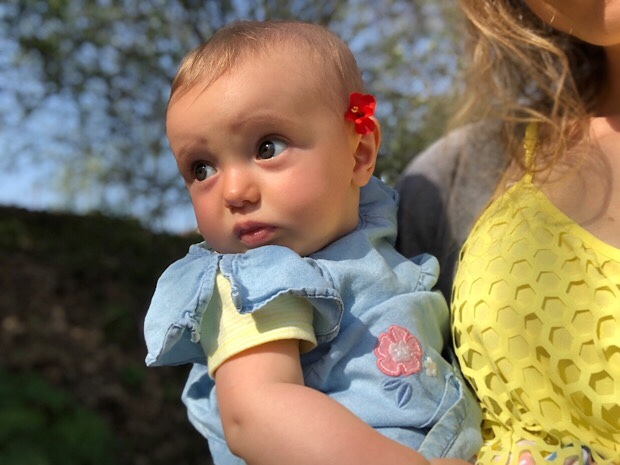 Likes Mornings, yelling and cooing loudly, being outside, attention and eye contact, lift-a-flap books, her jumper, being held, stroller walks, our pets, other children, standing and sitting, toys, screens, mirrors, and empty plastic water bottles. Dislikes Having her arms put through sleeves, toys or food being taken away, me leaving the room, and being tired. Favorite products Minnie Mouse jumper, Activity Gym and Ball Pit, Halo SleepSack, Baby D Drops, Mama Bear diapers, Amazon Elements wipes, Bee Crawl Toy, Where’s The Hen and Where’s The Dog books, Banana toothbrush, and Pop Up toy. Other notes We discovered Sadie is ticklish on her belly, her hair is getting lighter and longer, she still doesn’t have a set eye color (they’re either blue-gray or brown-hazel depending on what she’s wearing or the lighting), and she took her first trip to the Outer Banks! We have little daily rituals that we’re enjoying. I brush my teeth with an electric toothbrush while holding her and she thinks it’s the coolest when I put the brush against her head while it’s vibrating. We also try to get outside each day and touch a forsythia bush near our house. If we don’t do that, we look at trees and flowers and she touches them.